Lightpack PC Lighting System Review - This Kickstarter success is now widely available, but is it of any use to PC gamers? PC gaming relevant Kickstarter success stories feel as though they’re coming to be rather common at this point. A slew of quality games have managed to garner funding via the service and then ended up hitting Steam - and that includes some personal favourites of mine such as the wonderful FTL and Defense Grid 2. One of the non-game Kickstarter winners early on was Lightpack, a pretty cool little device designed to offer ambient lighting to PC users while they play, watch, work, or whatever else it is they’re up to. It hit Kickstarter in mid 2013, and was quick to double its $250,000 funding target. Less than a year later, it launched - and now it’s been on the market for a little while and has had a chance to mature somewhat, we’ve decided to take a look and see how it holds up from the perspective of the gamer. The tech included in the Lightpack box is deceptively simple-looking. From the impressive videos you’d expect something more crazy, but what you get here instead is nice and simple. 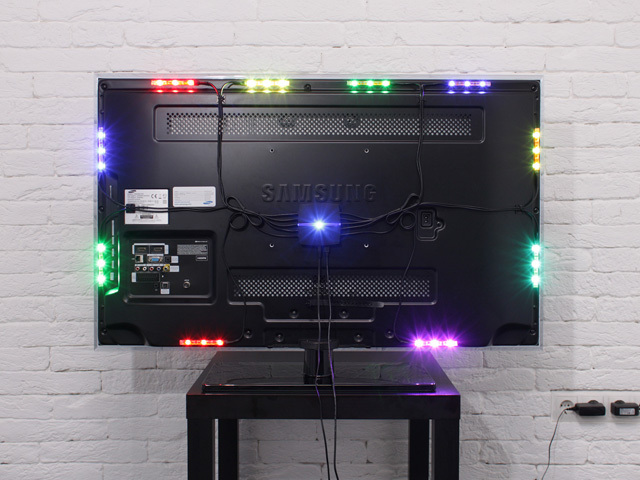 There’s ten LED strips that plug into the main Lightpack hardware, a power brick, a USB cable, and then stickers and cable ties to ensure everything is pulled together neatly behind your monitor or TV. The LED strips have to be stuck to the back of your monitor or TV of choice with included adhesive strips, and while this isn’t ideal, it’s also a realistic solution for the price. Retailing at just over $100, it’d be a little unrealistic for Lightpack to include a complex rig for hooking up the lighting system. This does the job - and while the spider network of cabling that comes as a result is never going to be neat looking, the inclusion of cable ties and other tidying pieces ensures that once the monitor is back in place again, everything is thoroughly out of sight and out of mind. The way it works is this: You configure the lighting strips into one of a few suggested layouts on the back of your TV set, plugging them into the Lightpack box, which also sticks in place there. 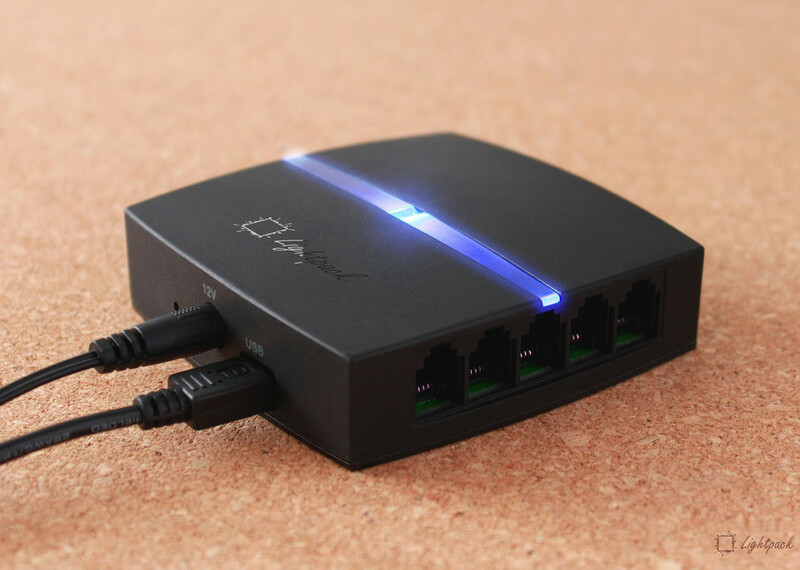 That box then plugs into the mains and via USB into your PC, and software handles the rest. Companies like Samsung and Sony have had a crack at creating TVs with built-in back-light tech, and the Lightpack actually works just as well and performs excellently, as demonstrated by the impressive original Kickstarter pitch video - the company didn’t struggle to reach that quality. All of this is powered by a set of drivers and software that has to be installed on the PC (or Mac) that’ll be displayed on-screen. Depsite the fact that the actual configuration to the back of the TV is simple, the actual software side was less streamlined and a little more confusing. Instructions guide you through initial set up, but designating screen capture ‘zones’ and such caused me a bit of frustration initially - but after a short time, I got the Lightpack working correctly. Once it is working, boy, is it pretty. 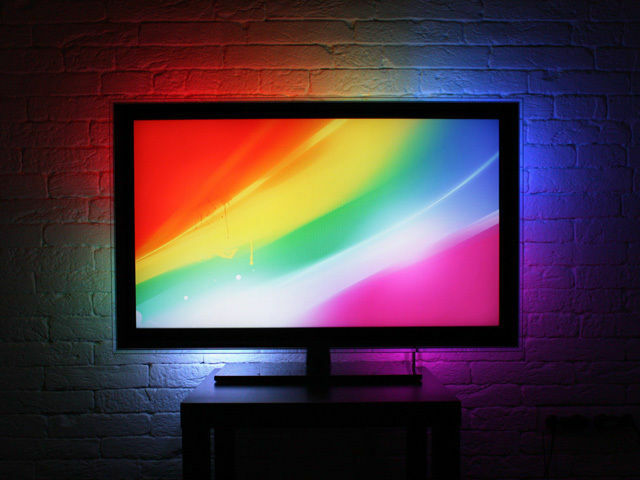 The LEDs project strongly onto the wall behind the monitor or TV you’re using, while the screen capture software works out what each area of the screen is displaying, averaging out that information and sending information to the 10 LED strips on what to display. The end result is the back of your screen will glow with whatever colour is dominating that edge of the screen at any given time, and it looks great. It’s hard to tell that this isn’t a TV with the technology built-in, in fact. For those who find the effect lacks punch, Lightpack’s software even supports having multiple devices hooked up, allowing for even more LED strips and even more zones of detection. The software also features a ton of more granular settings, though they are admittedly more complex. If you don’t want it to match the monitor, the light can also be programmed to be on in a flat colour or gently transition from one to another in a subtle manner. I didn’t find the Lightpack’s choice of software, Prismatik, had any effect on performance of games or my PC in general, though there’s a noticeable difference between the frame rate at which the desktop is captured and sent to the lights and that which most games will run at. In general, the Lightpack was capturing at around 20-25fps, which meant particularly sudden flashes weren’t translated through as well in gaming. While serviceable in games, where Lightpack really excels is in video content and casual use. In the case of the latter, it actually is quite a help when using the PC late at night - the subtle glow behind the monitor, matching the screen, helps to reduce glare and strain. In the case of the former, the reduced frame rate and general movement rate of movies means the Lightpack can project in a much more striking manner - and a movie-watching experience actually begins to feel a little bit naked without it. Lightpack is a pretty incredible little device for the price, though there are problems. Chief among them is the fact that a PC, Mac or rooted Android device is required to actually use the thing - there’s no HDMI pass-through or the like, meaning use with a console or a typical blu-ray player is simply impossible. That’s the greatest hurdle in front of this device, in fact - compatibility. If you’re the type with a PC that’s widely and often used, perhaps hooked up to a big TV for couch-gaming, however, Lightpack is actually a bit of a no-brainer. At its reasonable price point of $119, it’s a fun, novel and actually completely functional little device for enthusiasts that, in a future improved iteration, may actually hit the mainstream.